The flatcars, part of a gravel-hauling operation in Roscoe [Sun Valley], inexplicably came loose and had a four-mile downhill start before blazing through the Burbank station. The Burbank operator sent warning ahead that he saw something rip past—he thought it was two flatcars but wasn’t sure—before the runaway cars sped through west Glendale. At this point, the cars reached an estimated 120 mph, covering the two miles from west Glendale to Tropico in a minute, The Times said. The operator in the Glendale switch tower said he saw nothing more than a cloud of dust as the cars passed. “With wonderful tenacity, the runaways clung to the rails, though at some of the sharpest curves, the wheels on the outer side were in the air most of the time,” The Times said. 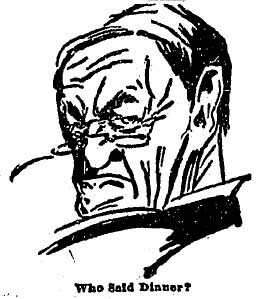 “Rattling across the river bridge near Elysian Park, the two flats, with journals smoking and platforms rocking like cradles, struck the maze of switches at the upper end of the Los Angeles yards and then beat it straight for the Buena Vista [Broadway] Street bridge and the tangle of tracks below,” The Times said. “Just before the cars entered the yards a signalman who had been out on the line inspecting the semaphores was poking leisurely along on his railroad velocipede, which was moving east on the westbound track. Alerted by the Burbank operator, several switchmen in the downtown yard attempted to put the runaway cars onto other tracks. Although the first man didn’t act fast enough, the second man threw a switch in an attempt to send the runaways onto the sidetrack leading to Standard Oil’s warehouse. The front wheels of the first runaway car went onto the side track, but the rear wheels remained on the main track, crashing into a railroad car loaded with machinery. 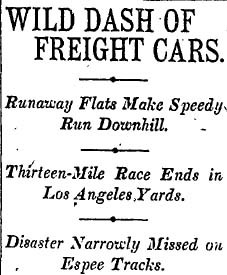 The crash from the first runaway car cleared the way for the second runaway car to keep racing through the rail yards at 40 mph. A switch was thrown and it was diverted onto a side track, where it grazed a freight train pulling into the yard before crashing into a box car. “At almost any other time yesterday the runaways would have encountered a heavy freight or a speeding passenger train, and no earthly power could have prevented a horrible crash with numerous fatalities for there was no time to hold trains after the alarm was given,” The Times said.